Graffiti is a Crime...or is it? A Banksy in New York. Where do we draw the line between vandalism and art? In this step you will read two street art case studies. In the next step you’ll have the opportunity to let us know what you think and to discuss some major questions of the street art debate. By all accounts, Shepard Fairey is an extremely successful and influential artist. His work appears in world’s top art museums: The National Portrait Gallery (US), The Victoria & Albert Museum (UK), and MoMA (US), just to name a few. 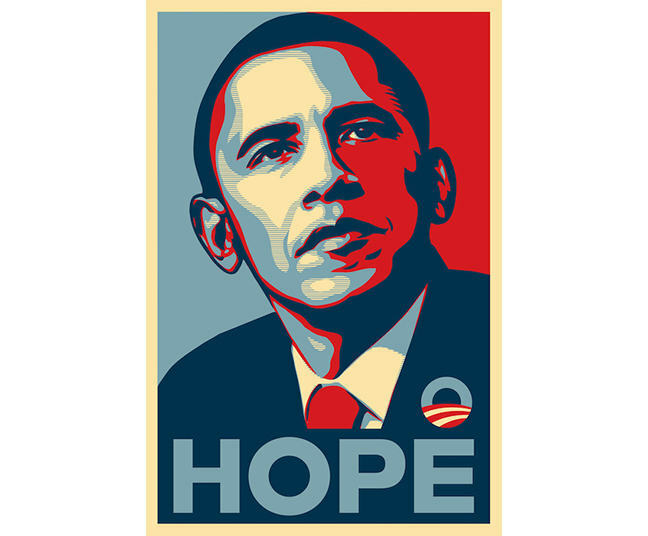 He’s the creator of the famous Barack Obama ‘Hope’ poster, considered to be one of the most iconic images of the 2008 US Presidential Election Campaign. 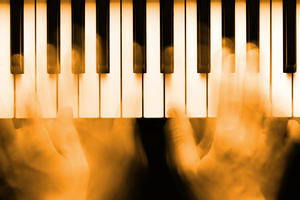 You have almost certainly seen his work…but not at a museum. 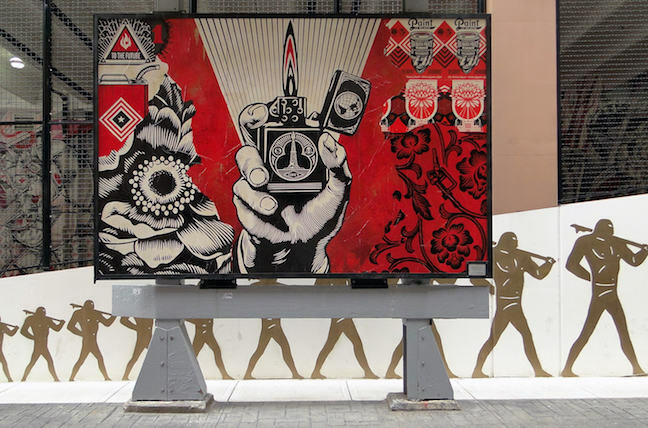 Shepard Fairey is a [street artist] and his work is nearly everywhere. 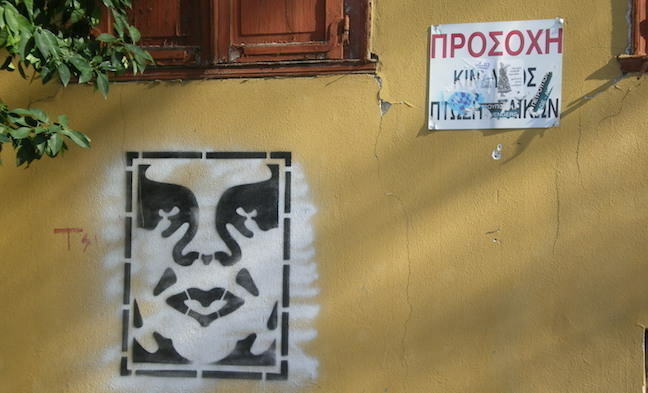 From a sea of Andre the Giant ‘OBEY’ stencils, posters, and stickers which have appeared in cities around the world since 1989, to large posters/murals covering once-bare outer building walls. For years, course leader Donna Yates would pass a large Fairey artwork every time she walked to the grocery store; she loved it. Perhaps you live near one of Shepard Fairey’s public works and don’t even know it. Keep on the lookout. A Shepard Fairey piece in Somerville, Massachusetts, that course leader Donna Yates would enjoy on the way to the store. Photo by Chris Devers. Yet there is one major issue with Fairey’s work: he paints, sticks, or glues his art on to public buildings without permission. Most cities consider this to be an illegal act of vandalism. Fairey, despite his fame, is the same as any teenager with a can of spray paint in the eyes of the law. Not every building owner wishes to be the canvas for Fairey’s politically charged works. 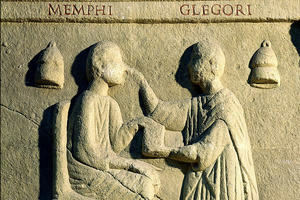 Not every city council wants public art put up, without permission, and without consultation of nearby residents. When locals and business owners complain, it can cost tens of thousands of dollars to remove one of Fairey’s artworks, money that could be spent elsewhere. Fairey has been arrested about 18 times in various US cities on vandalism-related charges. Indeed, on the book, Shephard Fairey is committing a crime. This is certainly what the city of Detroit, Michigan thinks. In 2015 they charged Fairey with counts of malicious destruction for artworks on 18 sites around the city. He could pay a fine that tops $10,000 for this and go to jail for up to 5 years. These are felony charges. 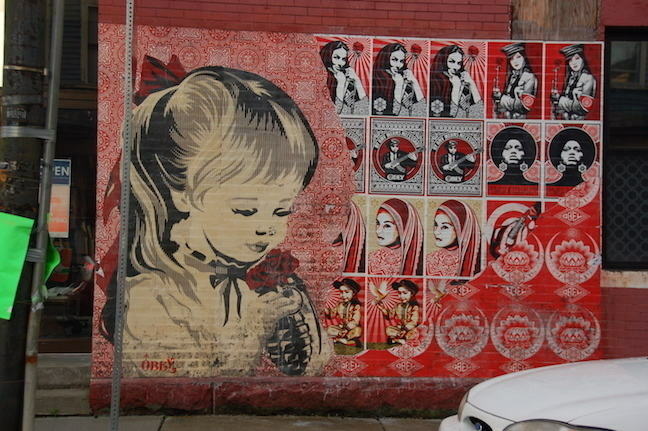 A Shepard Fairey piece in downtown Detroit. Photo by Maia C.
The element of surprise, the public and free nature of the work, the tinge of illegality, the idea of turning vandalism into beauty are all important elements of Fairey’s art. To refrain from posting his pieces covertly in public spaces throughout the world would change the very nature and meaning of his work. Indeed, many people enjoy his pieces: a blank and decaying wall is transformed into art. A small change that makes their lives a little more interesting: a famous artist’s work seemingly given to them free as a gift. That said, Fairey doesn’t ask those who are most affected by the artwork: the owners of the buildings. It’s their property and they are given no choice. For decades, Banksy has been an art world mystery. 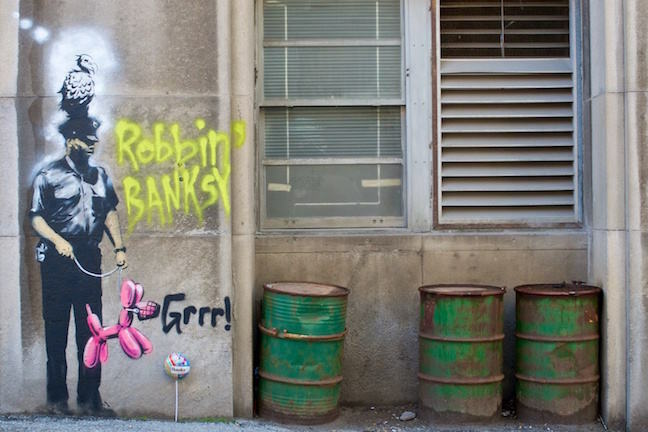 Despite being one of the world’s most famous artists, no one knows who Banksy is. Banksy is usually thought of as being one male British artist (so we will use the singular ‘he’), but could be female, a group of artists, or be from anywhere. That the secret of his identity has been kept for so long is truly remarkable. A Banksy work in San Francisco’s China Town. Photo by Thomas Hawk. 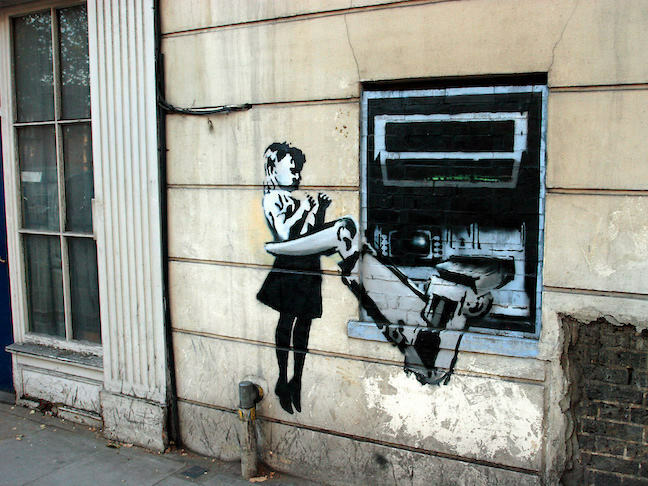 Like Fairey, Banksy is a street artist: he works mainly in stencil and spray paint. He uses the existing features of the buildings he paints on to create interesting pieces that often carry political or social messages. Also like Fairey, Banksy does not seek permission before executing an artwork on a building: if he did, his identity would be revealed. 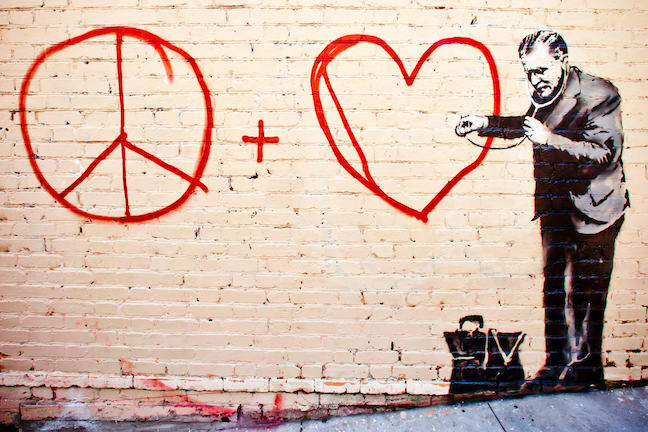 Unlike Fairey, however, Banksy has not faced criminal charges… or has he? 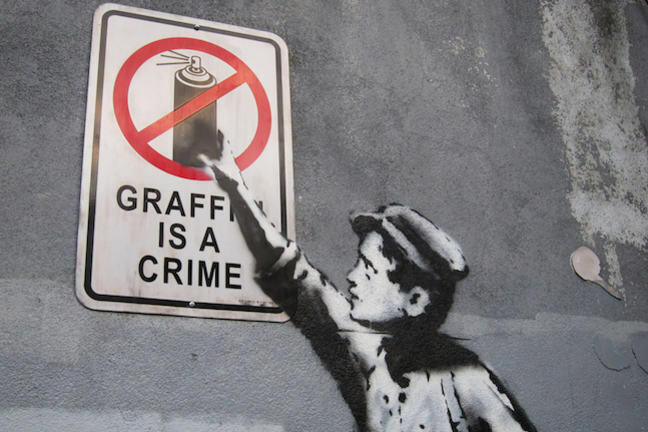 If Banksy was arrested for vandalism, would the police or any of us know it was Banksy? Probably not. A Banksy work in London. Photo by Gareth. 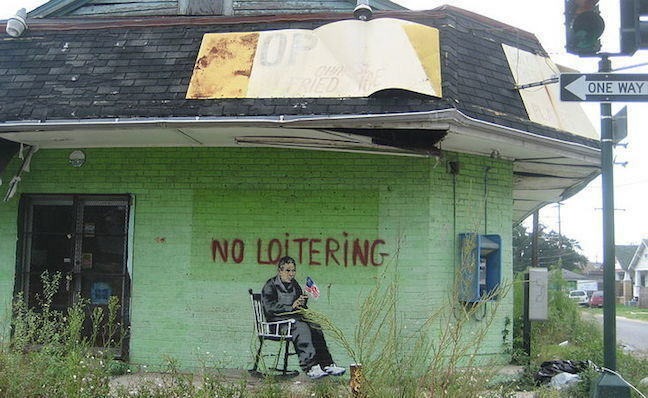 Banksy, it seems, is not very happy with the resale of his work. When asked to comment (via anonymous means of course), he stated “For the sake of keeping all street art where it belongs I’d encourage people not to buy anything by anybody unless it was created for sale in the first place”. It isn’t only the building owners that remove Banksy artworks to sell on the market. Well-known Banksy pieces have been known to disappear overnight and are presumed to have been stolen. This was the fate of ‘Vulture with fuel pump head’ taken from Kent, UK; of ‘Rat with a Suitcase’ which was on a meter box door in Melbourne, Australia; and of a number of other Banksy works. Even ‘Slave Labour’, the piece that sold for over $1 million was probably stolen. Yet this raises the question, who actually should own a Banksy artwork? Can owner-less art left in a public space be said to belong to anyone? Is it finders keepers? A Banksy work in New Orleans. Photo by Infrogmation. Perhaps even more interesting is that people, often other street artists, ‘vandalise’ Banksy works. In some cases this is to make a statement about a particular issue or to criticise Banksy’s popularity, which some see as hypocritical in light of the themes of his artwork. At other times, artists feel they are adding to the Banksy work, developing it further, making new art from existing art. Attempts to protect Bansky works with, say, plexiglass screwed to walls seems to attract ‘criticism’ in the form of defacement from other artists who feel that such preservation measures go against the purpose of street art. Banksy, himself, often employs existing graffiti in his artworks. Modified or vandalised. A Banksy work in Toronto with additions. Photo by Francis Mariani. Then, of course, numerous Banksys have been painted over or removed by city workers who saw the artworks as regular graffiti. Facing criticism after workers painted over a Banksy near a London Tube Station, London’s transport authority responded: ‘Our graffiti removal teams are staffed by professional cleaners not professional art critics’. Some might argue that this represents both art theft and the destruction of art that should be preserved. Others might argue that such is the nature of street art: if it was protected under glass it wouldn’t be so powerful. In March of 2016 an exhibition in Bologna, Italy called Street Art. Banksy & Co: Art in Urban Form came to the centre of the street art debate. Critics noted that several of the works on display were removed from their original locations without the artist’s permission. Many also felt that by charging an entry fee, in this case €13, the curators of the exhibition violated the spirit of street art by moving what was once public and free to a private, for-profit space. The exhibition is open until 26 June 2016. 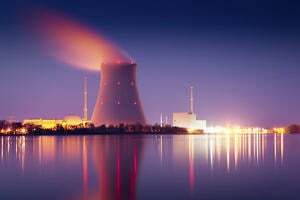 Read more about the controversy here. What do you think? Join the discussion in the next step.